On my way to work yesterday, I noticed the sidewalk along the D Street elevation of Constitution Center has been reopened. The sidewalk was temporarily moved to the street during construction and jersey barriers separated pedestrians from vehicle traffic. Also, as seen from the photo, new black Washington Globe lamps have been installed. Constitution Center is scheduled to deliver later this year; however, no tenants have been lined up yet. 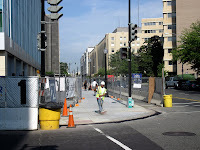 I seem to remember that when Constitution Center was earnestly negotiating for certain security restrictions it needed to use to attract GSA tenants it agreed to completely fund a new street level elevator for Metro at the D Street Metro entrance. So far I see no evidence of that and it is sorely needed since the huge L'Enfant station only has one street elevator entrance and is also otherwise very limited in its handicapped accessibility.